I miss writing about what I've read and I'm curious about what others have read, so here I am participating in the "kidlitosphere." I'll post some critical essay stuff, some book reviews, and write about my adventures with reading like a kid again. When thirteen-year-old Davia goes with her parents to Louisiana to help care for dying Aunt Mari she discovers a world that her parents can't see. In forming a tentative friendship with Aunt Mari, Davia learns about family history, life on a southern plantation, and that Aunt Mari can see ghosts. Ghosts of her family members from generations ago, that is. Mari has only one request for Davia--help her die in peace by helping the ghost of Emilie find her own peace. Davia begins a journey into a world that she isn't even sure she believes in, but she is determined to help her Aunt Mari. When Emilie does finally appear, she and Davia don't get along so well. As the two get to know each other and Davia finds out about the past (from Emilie and Mari), the two begin to work through their problems. Through Emilie, Davia begins to see the "ghosts" which she's been holding on to and Emilie finally tells Davia the truth about her death and why she insists on haunting the plantation. But will Davia and Emilie finally give up their ghosts in time to let Aunt Mari give up her own ghost? This story is beautifully written and perpetuates the often-used older woman-younger woman friendship through storytelling. While Sinykin sets her story in post-Katrina Louisiana, the plot does not revolve around disasters that happened during or after the storm. In fact, the mention of Katrina serves as a metaphor for Davia's life in the past few years (her mother has cancer). Just as Louisiana is slowly healing (with a few parts still in shambles), so is Davia and her family. The characters in this story are archetypes at best. For the most part, Davia, her mother, her father, and Emilie are just shells of real people. Only Aunt Mari, the dying one, is full of life and personality. However, in a literary kind of way the lack of "character" and the "shell-ness" of the other people in the story is a reflection of their hardships-they are simply going through the motions. The scenes in which Emilie and Davia converse seem strange and too young for the girls. They seem to play a game of secrecy more like 10 year-olds than 13 year-olds, which makes for a frustrating and unproductive story line. The girls fight like sisters (they are related! ), but don't really seem to have a good enough relationship for what happens in their last encounter to be plausible. I applaud Sinykin for the scene in which Aunt Mari "gives up her ghost." It is beautifully written with a quiet calm that isn't often seen in books with death scenes. Everyone should be so lucky as Aunt Mari. The description of Davia's emotions in this scene is enough to make even the most sensitive of readers smile and the most calloused readers feel the warmth and freedom of letting go. Of the many death scenes that I've read, this will be one that stays with me for a long, long time. This is a quick and heartfelt read that will have readers engrossed from the very beginning. 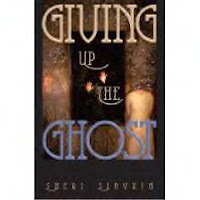 Thank you for your thoughtful review of my novel, GIVING UP THE GHOST. I was inspired to write it after a long period of writer's block, during which my mother was diagnosed with Stage 4B endometrial cancer. My Vermont College MFA adviser urged me to write about my fears, and that, coupled with my experience as a hospice volunteer, combined to give birth to this story. My mom died less than a year after my novel was published. Oops! Make that Mom died less than a year BEFORE my novel was published. What I didn't mention in the review is that I was a hospice volunteer during the first year of my MA studies. I took care of a woman a lot like Aunt Mari and she was the first and only death I experienced while in that position. Unfortunately, her death was not as peaceful as Aunt Mari's. I'm sorry to hear about your mother, I'm sure she would have liked the book (I've shared your book with my own mother). I think that losing your mother is a fear that everyone experiences, and you did a wonderful job of writing that into your book. Thanks for taking the time to read and comment on my review. I hope to read more of your writing soon! My nephew and I explore a book. I LOVE to read. I'll read just about anything. Right now, it is mostly children's, tween, and teen literature because of my job, but I read grown-up stuff too. Hopefully, I can start getting a few ARCs in the near future and do some (pre)reviews! For now, I'll just stick to what my library has and what I can find on the new shelf. 5 Pages - This book kept me up all night. If I didn't finish is in one sitting, I thought about it while I was away. 4 Pages - This book held my interest and made me want to read on. 3 Pages - This book was OK. I liked it, but not lots and lots. 2 Pages - This book was less than I expected, but still worthy of a read. 1 Page - I'm glad that's over (if I finished at all)! If you are an author or a publisher, I'd love to review your book(s). Please contact me through the e-mail listed on my profile and we can arrange a place for the books to be sent. In general, I'm not picky about what I read, but please keep it children's, tween, or teen material. I especially like sci-fi, fantasy, and future dystopia, but really anything goes! Please allow a few (3-4) weeks for me to read and review your book becaue I will review books in the order they are received. If I decide not to review a book for any reason, I will notify you of my decision.